In Part 1, we looked at the side sponsons. 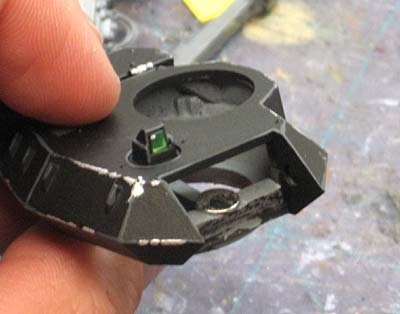 Now let's take a look at the turret and how I magnetized the weapons for that. I apologize now for the lack of good WIP shots, I got myself into a bit of a modeling frenzy and forgot to snap pics as I went along. This vehicle is set up to be used as a Rhino or a Predator. The Rhino part of it is easy. Just apply the regular side doors and the hatch on top. Nothing else needed. I've got the storm bolter option as well that can be used. The Predator version takes a little more work. I wanted to do the conversion with as few magnets as possible (to help with cost and minimizing the number of pieces that can break off). This can be tough though, most of the time you'll need two magnets for each joint and it adds up fast. The first hurdle was figuring out how I was going to attach the weapons to the turret. I figured I would cut the side pins of each weapon so they could be slid in and out of position and then figure out a way to keep them there. 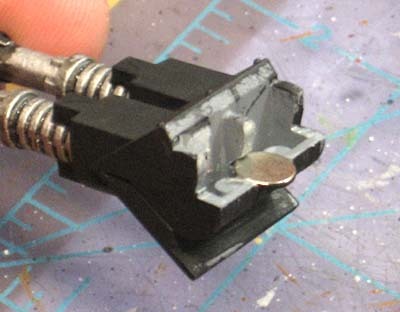 I used a piece of sprue an built a crossbar just inside the face of the turret. This holds the turret magnet in place and provides a resting point for the weapon itself so it doesn't rotate up and down when in position. Then I cut out a portion of the weapon along the backside, carefully trimming a little bit away each time and test fitting it in position. Once I had just enough cut away at the correct angle so the weapon sat in position correctly (with the magnet in place) I glued everything together. This might better explain it. 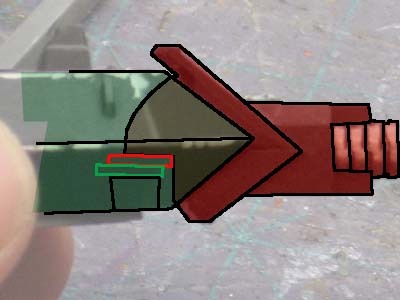 The red area is the weapon itself, the green area is the turret. You can see where the two colored (red and green) magnets meet up inside the turret. What this allowed me to do was position the turret exactly as it would be if I glued it in place using the original pins. Then it was a matter of taking the other weapons and repeating the process. The assault cannons were another challenge though. 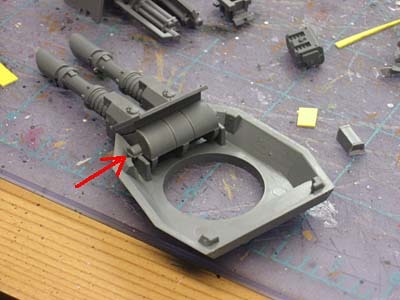 They were not built off the standard weapon housing, so it took a good bit more work to get them in position and a magnet added to the weapon itself that matched the turret magnet. 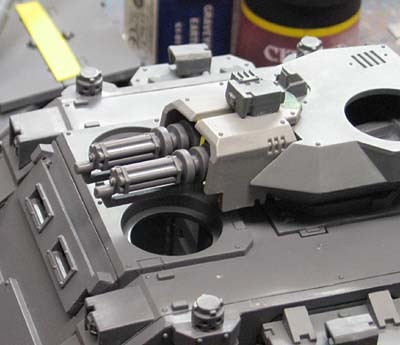 The assault cannons are made from the plastic ones from the Ravenwing set along with part of a Hunter Killer missile and the housing is from a Land Raider weapon but cut in half and made slightly narrower so it would fit into the Predator turret opening. It took lots of plasticard to get everything together and in place. 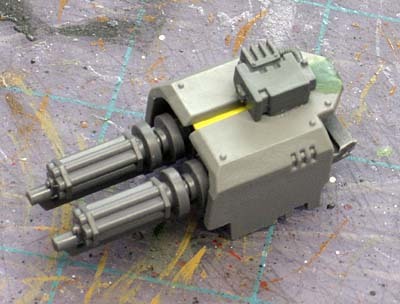 If I were to build it again, I would try and find another twin linked lascannon, cut off the barrels and glue the assault cannons in their place. It would save tons of work. To get the ammo boxes to sit on the back of the turret, I glued a magnet to the inside of the turret before gluing it (the top and bottom halves) together. The magnet is strong enough that when I add a magnet to the ammo box (recessed into its mounting surface), they stick together perfectly. This allows the turret to be used if you want without having to look at a magnet along the back of it. One thing I needed to do was add a magnet to the underside of the turret itself. With the added weight of the weapons on there, it would fall forward if it was not held in place somehow. 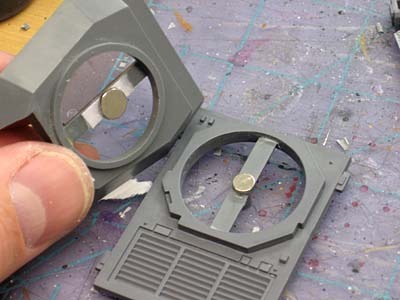 A couple pieces of sprue lined up together with magnets in between were all it took to keep it from tipping over. As you can tell from some of the pics, the model is nearly complete. Once I get all the pieces painted up this week, I'll take some pictures of the finished tank to show you guys the results. I'm not gonna lie, it's a good bit more work to magnetize a model. It's well worth it though. I don't think I'll ever build another model (vehicle) without going the extra step and magnetizing it's options. Pics of the finished model are here. As a follow-up to this post, I have another post on things you can do to your vehicles to give them that extra boost. From freehand to extra armour templates. That post can be found here. Very smart conversion fella... I like it! very useful... I definitely need to try this out. Where do you get your magnets from? SandWyrm: I get them from my FLGS (Game Vault). Link in sidebar. They are rare earth magnets and I pick up a variety of them to fit whatever I'm putting together. I've been magnetizing for a while as well: I have an old leman russ demolisher that I call my swiss army tank -- it has options to be a vanquisher, exterminator and executioner. I've done likewise for my Baneblade and Shadowsword. 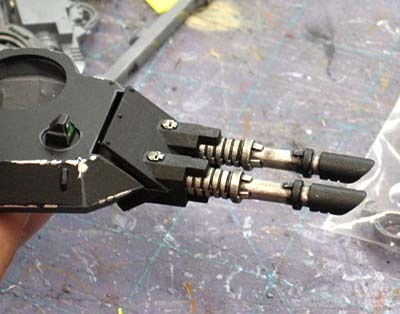 I also magnetized the weapons on my SW Drop Pods. I usually go to K&J Magnetics -- I just got 100 3mm (~1/8") and 100 6mm (~1/4") rare earth magnets for $8.00 + $5 s/h. I really like your conversions! Re. the whole 'making sure we get the right polarity on each edge' thing, I save time with the following method. 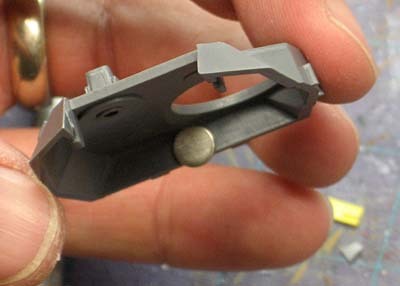 1: Mount one magnet on an old piece of sprue. 2: Go through your packs of magnets, testing each one against the mounted magnet. 3: As you test each magnet, mark the back with a black marker pen. Voila; my pack of magnets is now marked up for polarity. By keeping the same piece of sprue with the reference magnet in, I can mark up every new pack of magnets for polarity in the exact same way. For instance, on multiple dreadnought arms; I just use black-side-out for all the arm magnets, silver-side-out on the body. Cheers for your ever-informative blog! Adam: Excellent tip! I know I check, double check and then check once more before gluing my magnets in place. I'm so scared I'll get them wrong and have to try and remove them.